About Morteza Farahnak : During his childhood, he was always interested in visual things, such as colorful toys, moving billboards, paintings and etc. He was one of the bests in painting course in elementary school. He started Art from high-school when he registered in Cameraman major. After high-school, he entered to Soroush Technical University in Isfahan to study Graphic design. during last year of education, He started working as a Graphic designer in Hebe company. 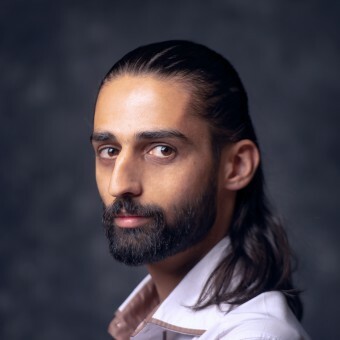 As he graduated Graphic design in 2010, he left Hebe company and start working as a freelance graphic designer in Qom. Since then, he worked with different projects and has participated in many national and international poster exhibitions. In 2011 he won second prize of International HIV poster competition in Skopje/Macedonia. Starting his Bachelors at Islamic Azad university made him stop hard working, but he won First place of 11th Biennial of Qom's Graphic Designers, and was invited to Dumlupinar University/Kutahya/Turkey to participate in a Poster exhibition and two workshops. He gained B.A in Graphic design in 2014 and started hard working again. In 2014, he established Designers Building and started bigger projects. As a young graphic designer, he loves to learn new things in the world of graphic design, therefore he has been trying to participate in different workshops; until now he has met great designers such as Finn Nygaard from Denmark ,Piotr Kunce from Poland, Alexander and Svetlana Faldin from Russia Ali Tomak, Yosef Kes, Ali Can Metin, Cem Cara from Turkey, and Masoud Nejabati, Farzad Adibi, Mehrnoosh Moshiri, Mohammad Ardalani, Majid Kashani from Iran. Design is the beauty for our eyes but Art comes from our soul. 2014, Graphic Design and Illustration, BA, Islamic Azad University branch of Qom, Iran. 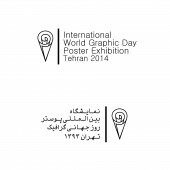 2014, Visual Identity designer of World Graphic Day international poster exhibition, Tehran Artistic Scope, Tehran/Iran. 2013, Invited as Iranian young designer to be participate in a poster exhibition and two workshops, Dumlupinar University, Kutahya/Turkey. 2011, "The Pause", Soore Gallery, Alborz/Iran. 2011, "Five Generations of Ashoora posters", Imam Ali Museum, Tehran/Iran. 2012, "Segunda llamada", José Luis Cuevas Gallery,Mexico city/Mexico. 2012, "Prevention of violence", Ataturk university, Erzurum/Turkey. 2012, "Free Posters", Aftab Gallery, Tehran/Iran. 2013, "Iranian student poster exhibition", Dumlupinar faculty of Fine Arts, Kutahya/Turkey. 2013, "6th United Designs", Saint Luis Fine Arts university, Missouri/USA. 2014, "Open Interpretation", Afdesta Gallery, Shiraz/Iran. 2014, "7th United Designs", Shanghai Normal University, Shanghai/China. 2011, 2nd Prize, International HIV Poster Competition, Skopje/Macedonia. 2012, 1st Place, 11th Biennial of Qom's Graphic Designers, Qom/Iran. 2011,"Hope Knows No Borders", Twisted Manga electronic magazine, 21 September, Mexico City/Mexico. 2012,"Four Persians In Turkey Exhibition", Etemad newspaper, 30 June, Tehran/Iran. 2012,"Qom branch student success in International Festival", Farhikhtegan newspaper, Tehran/Iran. Qom IRIB, Tehran Artistic Scope, Amin Commercial Complex. Press Members: Request an exclusive interview with Morteza Farahnak.